If you don't fry food regularly, it can be a daunting task—especially if you're serving up once-a-year holiday fare that you want to get just right. Latkes, the traditional Hanukkah treat, are crispy fried potato pancakes, and if not made correctly, can end up being a soggy or oily mess. These tips, from which oil to use to keeping them crispy, will have you frying delicious Hanukkah latkes like a pro—and with a little practice, you might even decide to start making them year-round! No matter how great your recipe, the success of your latke frying efforts hinges on having the right equipment. You need a pan that will heat evenly, can withstand high temperatures, and offers enough room to maneuver for easy frying and latke flipping. 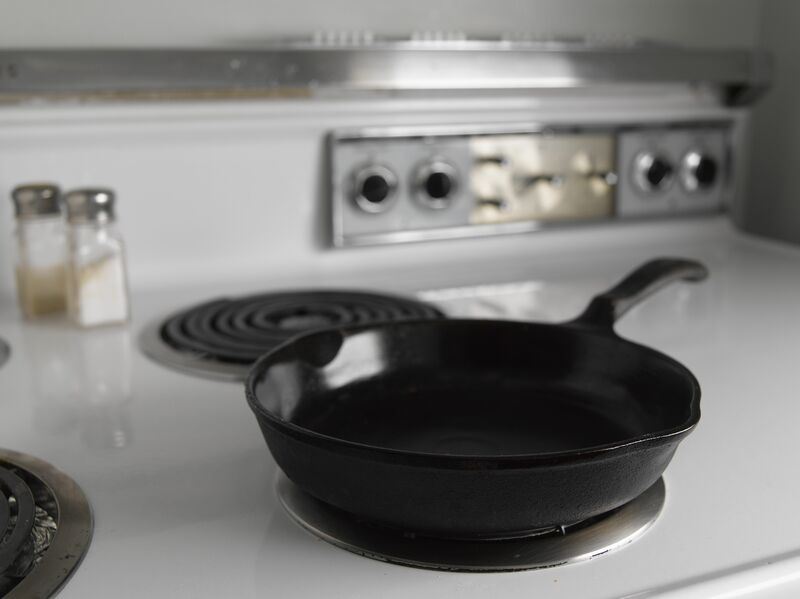 Banish thoughts of using a flimsy nonstick pan—you won't get decent heat distribution or retention, and Teflon isn't a particularly safe choice for frying. Heavy stainless steel works, though you may get some sticking if you go light on the oil or it isn't hot enough. Cast iron is a safe bet, which is naturally nonstick and produces crisp, nicely browned latkes. As the story of Hanukkah goes, the oil in the temple that was supposed to last only one day lasted for eight. Since this oil was made of olives, it seems only fitting that we use olive oil to fry up the latkes. While many argue that olive oil has a relatively low smoke point and it isn't ideal for frying, in truth, olive oil's smoke point is perfectly fine for frying, and this fat has a long history of high-heat cooking in many cultures. The bigger issues may be its expense and the distinctive taste that olive oil imparts. Therefore, some may turn to vegetable oil, an ideal oil for frying. However, since vegetable oil really has nothing to do with Hanukkah, there is some disconnection here. One solution is to use a mix olive oil and a more heat stable oil—like grapeseed, avocado, or canola—which effectively raises the smoke point, and softens the olive notes, so they don't compete with the flavor of the latkes. Of course, if you want to capitalize on olive oil's bolder flavor, then by all means, go for it. When you grate raw potatoes, you'll notice liquid collecting in the bowl (how much depends on the type of potatoes you choose since water content varies by variety). One of the most important tips to crispy latkes is to get rid of as much liquid as possible; water in your potato pancake batter makes for mushy latkes. Worse yet, it can make hot oil splatter, causing cooking burns and kitchen mess. The easiest way to eliminate the liquid is to gather the grated potatoes in a clean tea towel and twist to squeeze out the liquid over a bowl. (You can also use paper towels.) Just don't dump out the water—there's a secret ingredient hiding under all that liquid that you will use later. The act of grating potatoes releases some of the potato starch, and you want that starch in your latkes. (Think of it as the glue that helps hold the latkes together.) The starch will settle to the bottom of the liquid in the bowl, so slowly and carefully pour off the water and salvage as much potato starch as you can. Then mix it into your latke batter. To get the crispiest latkes you need to make sure the oil is the right temperature. If your oil isn't hot enough, your first batch of latkes will stick or flip poorly, and you'll have a mess on your hands. Before you start frying, check the temperature of the oil—about 365 to 375 F (185 to 190 C) is ideal. If you don't have a deep-fry thermometer, watch the oil; when it starts to shimmer, wet your fingers, stand back, and carefully flick a couple of drops of water into the pan. If the oil sizzles, you're good to go. Alternatively, you can toss a small bread cube into the oil; if it's golden in about a minute, you are ready to begin frying. When there's a big bowl of latke batter in front of you and eager eaters standing by, it's natural to want to move things along by making as many latkes as possible at once. But don't make the mistake of crowding the pan—your latkes need space! Overfill the pan, and you'll lower the temperature of the oil (which causes the food to absorb too much oil), plus leave no room for easy turning. If you really want to expedite things, your best bet is to use two skillets. Latkes should be crispy, not greasy. Have a paper towel-lined plate or cookie sheet at the ready, and transfer the latkes to it as they come out of the skillet. The lined tray will absorb any extra oil and help prevent sogginess. Many folks swear latkes taste best straight out of the skillet, but if you want to serve them at a meal, you need to find a way to keep them hot and crispy while you finish cooking. One solution is to place them in a preheated oven that has been set to 250 F/120 C. Transfer the fried, drained latkes to an ungreased baking sheet and keep them warm in the oven until the whole batch is cooked. Serve immediately. If you are making the latkes well ahead of time, you can freeze them and then reheat before the meal. If you choose this method, do not drain the latkes on a towel after frying; you will need the oil to help them crisp up in the oven later. Simply transfer the pancakes from the frying pan to a baking sheet, let cool slightly, and then place in the freezer. Once they are frozen you can store in zip-top bags. To heat, place latkes in a single layer on a baking sheet in a 350 F/175 C oven until hot and crisped up. As with all cooking, there's an art to successful latke frying that comes with practice. Rely on your senses: if you see the latkes browning too quickly, lower the heat a bit. If there are burnt bits in the oil, take a moment to carefully wipe out the pan and add fresh oil before continuing with the next batch. If you don't hear the oil sizzle when you add the pancake, the oil isn't hot enough. If you smell something burning, it means the oil is too hot. With little adjustments and a taste test or two, you'll find your rhythm and turn out perfect latkes. 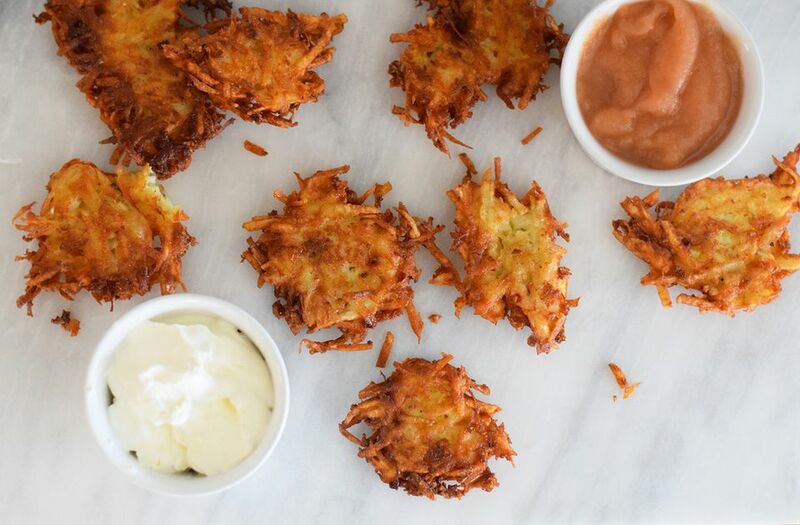 Think beyond plain latkes, and have some fun with accompaniments, from applesauce and sour cream to chutney and salsa. Add a touch of your favorite herbs and spices to perk up a standard recipe, or experiment with different veggies. You've got eight nights to play with new recipes, so why not keep things interesting? Just remember, no matter what ingredients you choose to add, be sure to season the batter well with kosher salt; all of the best frying techniques can't make a bland latke flavorful.